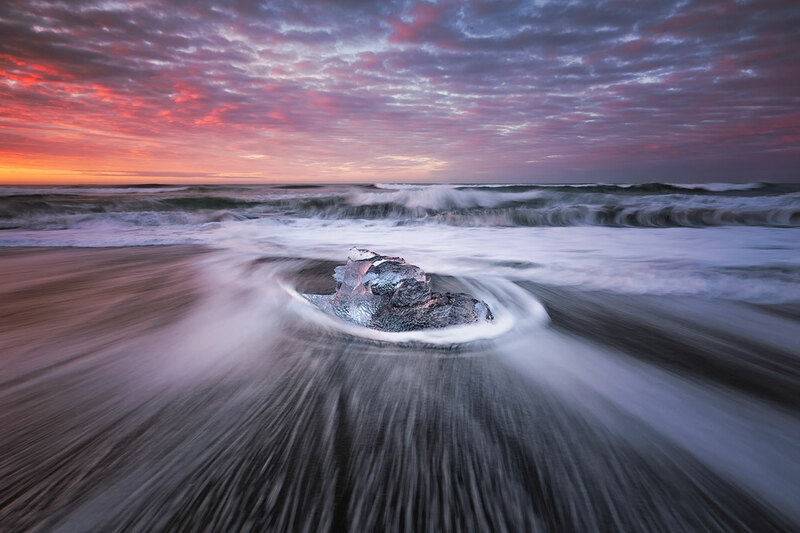 Iceland is a magical place full of mountains, active volcanos, glaciers and black sand beaches. It's diverse topography brings a lot of photographers, and tourists in general, to this small north western European island. 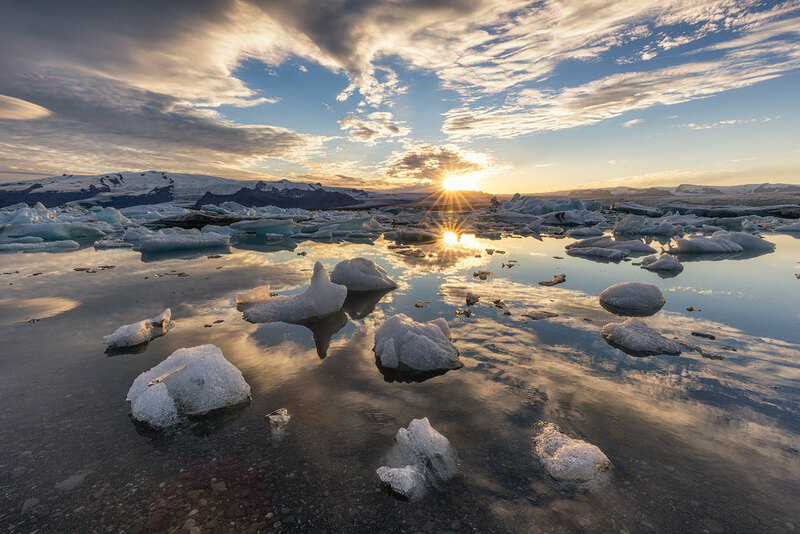 Iceland has only seen it's rise to fame recently, before the turn of the century not many people would think about vacationing here. Now it's predicted more than 2 million visitors will frequent the island that only has a population of just over 300,000. I think this plays a vital role in the countries recent tourism success story, it rugged untamed mountains and raging waterfalls dominate the attention of most photographers that come here. Nonetheless, it's certainly true that new compositions can be found you just have to be willing to venture a little further away from the beaten path. 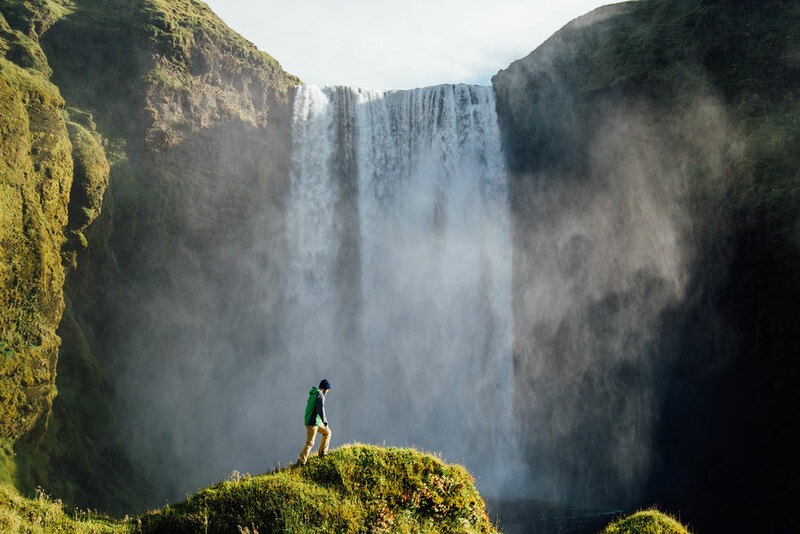 Even if you've seen thousands of photos of Iceland it's nothing like seeing it in real life. One of Mother Nature's true masterpieces. All the locations mentioned in the post are included in my photography road trip itinerary around Iceland. If you're considering going, but are worried about your budget check out this post I wrote about travelling Iceland on a budget. As always this list is subjective, these are my favourites and hopefully after visiting they will become some of yours too. Seljalandsfoss lies 120 km southeast of Iceland's capital Reykjavik. It’s proximity means that it gets a lot of attention. With that said, it’s still surprisingly quiet at sunset, which I think is the best time to photograph it. The view from behind the waterfall looks west. There are lots of different vantage points from which you can get your shot. No matter which one you pick make sure you have waterproof jacket and trousers with you. Also don't forget to properly secure your camera. The mist coming from the waterfall is relentless. Another waterfall on the southern coast quite close to Seljalandsfoss, Skogafoss is a very iconic location which summarizes Iceland for me. Looking directly from the Ring Road you’ll be staring jaw gaping wide open, north north east. When the sun rises in the east it’s very common to see rainbows form from the spray being blown around by the notorious Icelandic winds. It’s where I spent one of the nights on my 10 day Icelandic Roadtrip. Best time to shoot here is early in the morning, before buses with hoards of tourists on boards arrive. 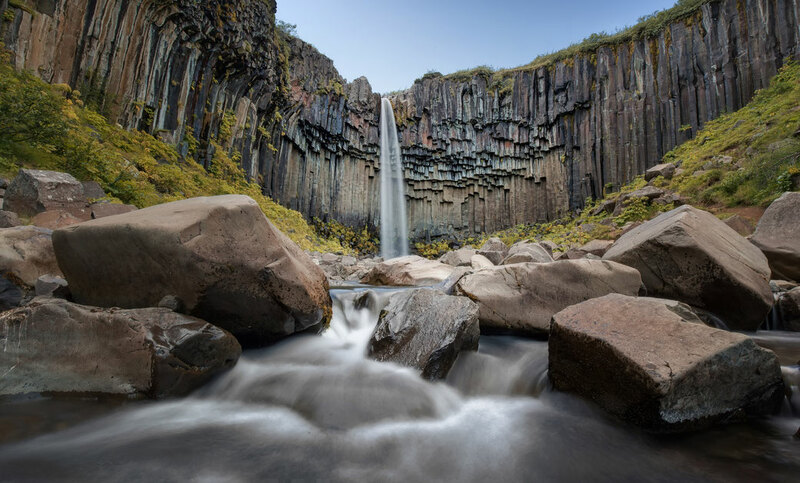 Svartifoss is a waterfall in Skaftafell in Vatnajökull National Park in Iceland. It's framed by hexagonal dark lava columns, which gave rise to its name. Svartifoss translates to Black Falls. From the visitors centre it’s around a 30 minute easy up hill hike to the base of the falls. I was seriously considering doing a scenic flight here over the glacial river beds but my budget couldn’t afford it at the time. 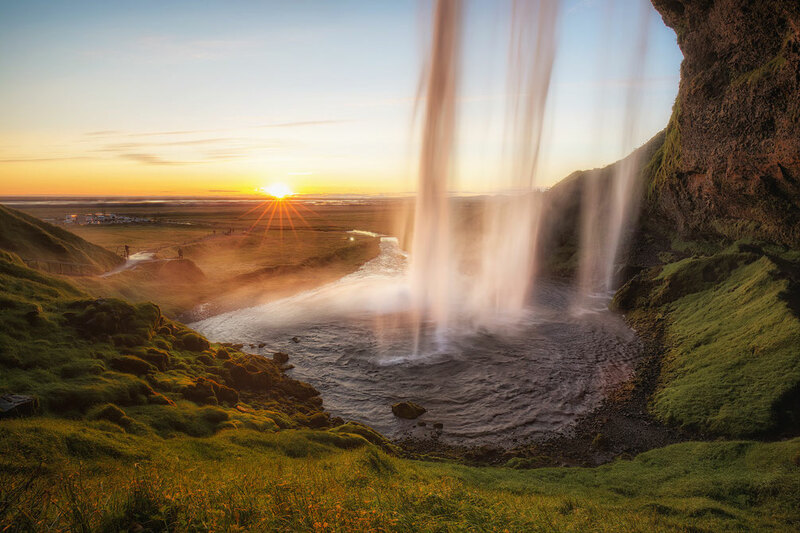 The best time to photograph this beautiful waterfall is early in the morning. Landmannalaugar in the southern highlands of Iceland gets the least amount of visitors out of anywhere on this list. 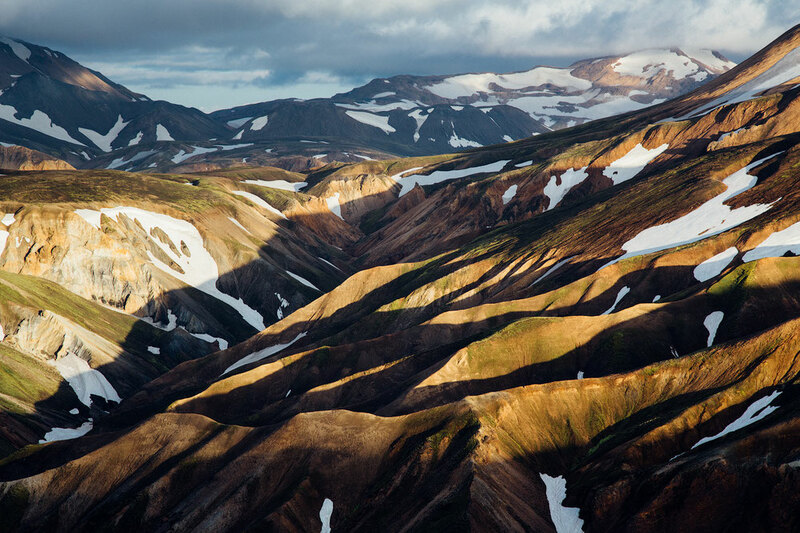 It’s a difficult journey to get there, which I cover in detail in my guide to Landmannalaugar. 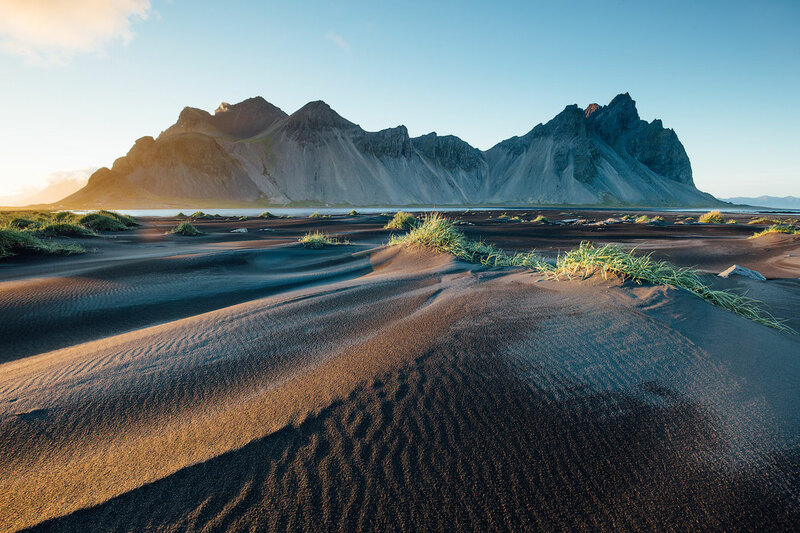 In this mountainous region of Iceland the views are the best during golden hours, just after sunrise or before sunset when shadows exacerbate the contours of the hills. The young lagoon that, only 100 years ago was completely covered in glacial ice, is a beautiful spot at all times of day and compositions can be found in every direction. You can often see seals swimming around in the water and playing on the icebergs too, so keep your eyes peeled. The ever changing nature of this place makes everyone's shots unique as icebergs continue to come and go, turning over and changing shape. On the opposite side of the road from the Jökulsárlón glacier lagoon is the aptly named Diamond Beach. Whether there’s ice on the beach or not is complete luck, as there’s no way to predict when the ice will carve off the Breiðamerkurjökull glacier that lies to the north (Don't even ask me how to pronounce that). The icebergs eventually make their way through the lagoon and get dragged out with the current to the Atlantic Ocean. Then high tide pushes the ice back up onto the beach. Best time to capture this phenomenon is at sunrise. 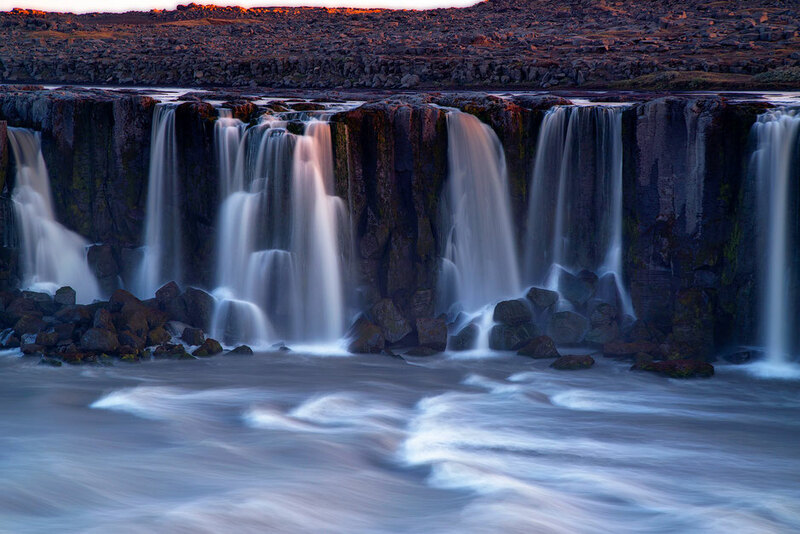 Tucked away in the north east corner of Iceland, Selfoss is a humble giant. 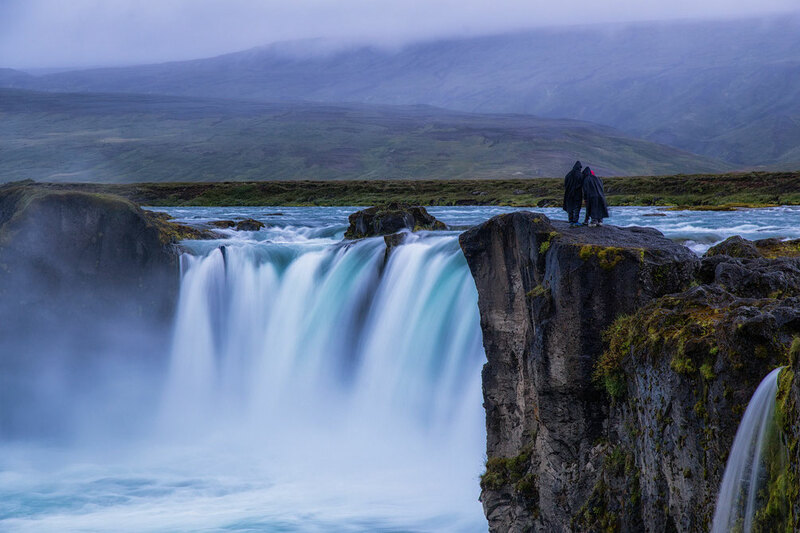 The water flowing over the cliffs here is only lessened dramatically by the fact, that it’s situated only a few hundred metres away from Europe's most powerful waterfall, Detifoss. Depending on what side of the river you find yourself on, will determine whether you’ll want to shoot sunrise or sunset. The photo above was taken on the east side of the river at sunset, looking to the west. In my opinion this side of the waterfall is better. This photogenic range lies on the southern coast of Iceland. It’s beautiful location and orientation make it spectacular for sunrise. Especially if you want the pink hues of the first light. Don’t get me wrong sunset isn’t bad either! The best view point on the peninsula is at Stokksnes, that’s where you can find the sparsely spread grassy hills (photo above). Godafoss is in the Lake Myvatn area, in the north east of the island away from the hustle and bustle of the south west. That’s not to say it doesn’t get it’s fair share of tour buses. I was waiting at Godafoss for three days to get a decent photo but it never stopped raining. A word to the wise, be prepared not be to able to photograph all these locations in brilliant conditions. Iceland’s weather is treacherous to say the least. To make the best out of a gloomy day and still come out with a decent shot you can use a 6 stop ND filter to create the effect of a silky smooth water. Last but not least. 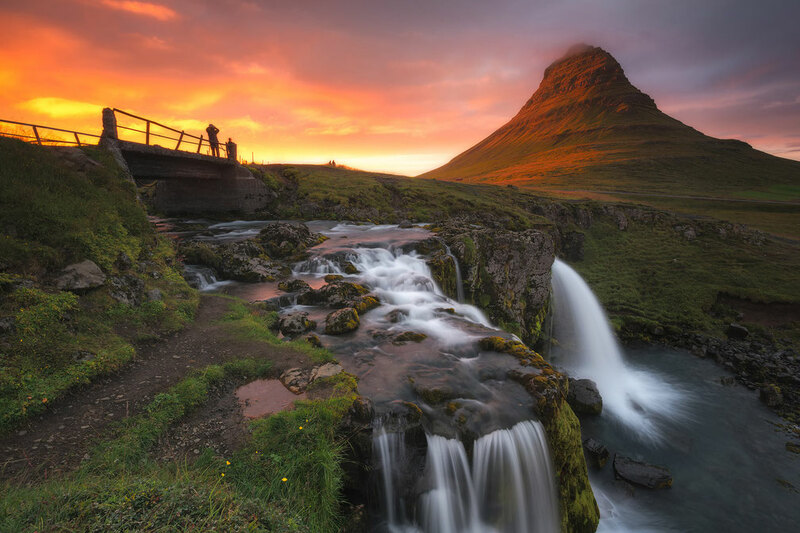 The church mountain, Kirkjufell, is on the Snæfellsness peninsula around 175km to the north west of Reykjavik. At 463m tall it’s not the biggest but it's very nicely framed by the neighbouring Kirkjufellfoss waterfall. It’s about 50 metres away from the road, but at the same time it looks so serene as if it was in the middle of nowhere. Looking to the west makes it a perfect sunset spot. A must for all photography lovers out there. A decent tripod allows you to shoot longer shutter speeds smoothing out water and helps you produce super sharp photos. After owning 3 different tripods I finally found my favorite. I now use Sirui W2204 waterproof tripod with the K20x ballhead. To carry all my camera gear I use a backpack made by a company called Fstop, specialized for outdoor photographers. It's super useful and has loads of compartments for filters and memory cards. Iceland has a lot of waterfalls and hence a lot of mist. Always keep a lens cloth handy so you can dry the front of your lens. I usually have 3 of them close to me, because I tend to displace them very quickly. Neutral density and graduated neutral density filters really came in handy in Iceland. They allow photographers to have much more control over the shutter speeds. I use 6stop and 3 stop graduated firecrest ND filters by Formatt Hitech and I'm really pleased with the quality and lack of colour casting they deliver. A Circular Polarizer is another filter that should be on your packing list. It's perfect for removing glares from the sun reflection in the water and adding contrast to your photos. 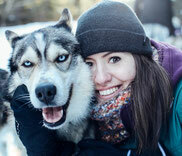 If you are interested what equipment do I use to capture the photos check out my camera gear.